SSI’s personnel are industry leaders and are able to share from their vast project experiences. 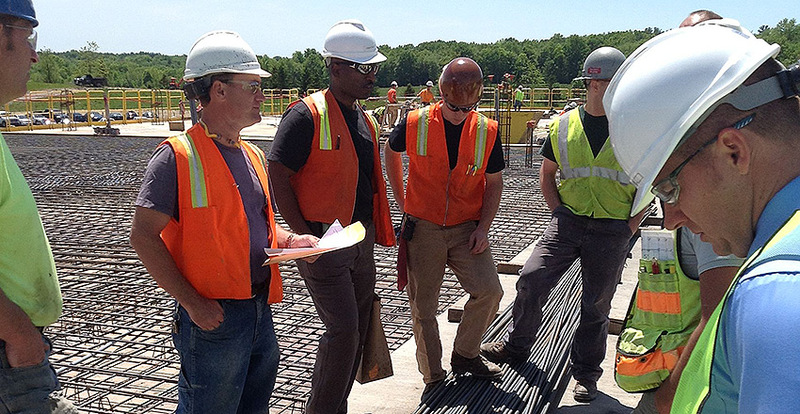 We work closely with the Owner, Architect and Engineering Team, providing consultative services that include designs, document review, mix design analysis, comprehensive pre-slab meetings, on site condition surveys and slab placement observations. We strive to assist in developing an economical slab design and document package that anticipates and accommodates each unique slab requirement. Our Consultants are also able to offer solutions and inspiration for your exposed and decorative concrete needs, including polished and stamped concrete, stains, dyes and overlays. The foundation for any successful project starts with appropriate design and materials that meet the specific requirements of the client. SSI has provided many different slab designs, including unreinforced with joints, reinforced with joints, continuously reinforced with limited joints, shrinkage-compensating concrete, post-tensioned, fiber reinforced slabs, formed construction, and slabs on metal deck. Whether you need a superflat floor, exposed polished floor, decorative concrete floor, freezer slab, containment slab, suspended slab, topping slab, pavement, etc. we can develop economical solutions for the project requirements. We can review project documents for internal consistency and general conformance to accepted industry standards, while checking the efficiency of constructability. SSI can optimize concrete mix designs with review of mix proportions, aggregate gradations and sieve analysis, chemical admixtures, and water to cement ratios, while taking into account the local materials that must be used. We will work with your team to facilitate resolutions of conflicts, and/or development of alternative details, and communicate with the client to help minimize potential development of adverse conditions that may affect the performance of the concrete slabs. Participation begins at the time of project conception, while following through each step of the way to completion of the final surface finish. SSI can provide different slab design options, review and evaluate construction bids, conduct your preconstruction meeting, facilitating comprehensive and detailed discussion with the entire team, including the owners, architects, engineers, designers, general contractors, concrete finishing and polishing contractors, ready mix producers and testing firms to clearly define expectations, roles and responsibilities of all parties.